Falklands penguins - Falkland Islands penguins, seabirds, seals, sealions, birds and other Falklands wildlife. Please help support our work to save Falklands wildlife. Make a Donation using our secure on-line credit card form. .
For people wishing to know more about our penguin research, you will find below a selection of recent publications. Maps and figures relating to these publications can be found in Picture Gallery 1. Any information used or copied from these reports MUST be referenced to the source article as given at the heading of each report. 1) Bingham, M. (2001) Surveying, Monitoring & Conservation of Penguins in the Falkland Islands and Southern Chile. (PhD Thesis). 2) Bingham, M. (1998) The distribution, abundance and population trends of Gentoo, Rockhopper and King penguins at the Falkland Islands. Orxy 32(3): 223-32. 3) Bingham, M. (1996) Censo de los pingüinos de las Islas Falklands. Unpublished Spanish resume of above. 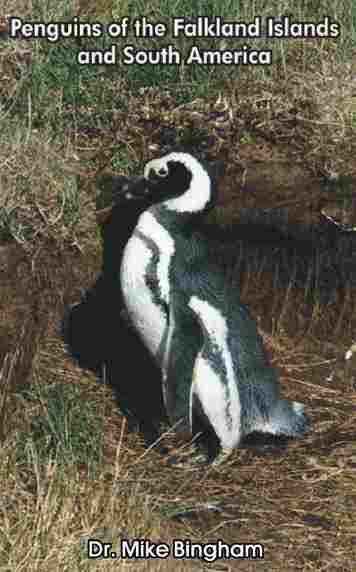 4) Bingham, M. (1998) Penguins of South America and the Falkland Islands. Penguin Conservation 11(1): 8-15. 6) Bingham, M. (1999) Field Guide to Birds of the Falkland Islands. The Falkland Islands are an important breeding site for southern rockhopper penguin (Eudyptes chrysocome chrysocome) and magellanic penguin (Spheniscus magellanicus). Both have global populations restricted to the Falkland Islands and southern South America. Population census and monitoring work conducted by the author show that these populations have dramatically declined in the Falkland Islands, but not in nearby Chile. The suspected cause of the Falklands decline is a reduction of fish and squid due to commercial fishing around the Falklands. Comparison of penguin diet for the two regions is presented, and studies of foraging behaviour show that magellanic penguins in the Falklands require almost twice as long to collect food for chicks as in Chile. Breeding success and chick survival are also much higher in Chile than in the Falklands. Ecotourism has increased rapidly over recent years in the Falkland Islands and Chile. Monitoring by the author indicates no detrimental impact on penguin colonies in the Falkland Islands or Chile from the current level of tourism. The effects of recent oil spills in the Falkland Islands are discussed. The Falkland Islands lie in the south-west Atlantic, approximately 450km east of southern South America. The archipelago is made up of over 700 hundred islands, comprising a total land area of over 12,000 sq km. 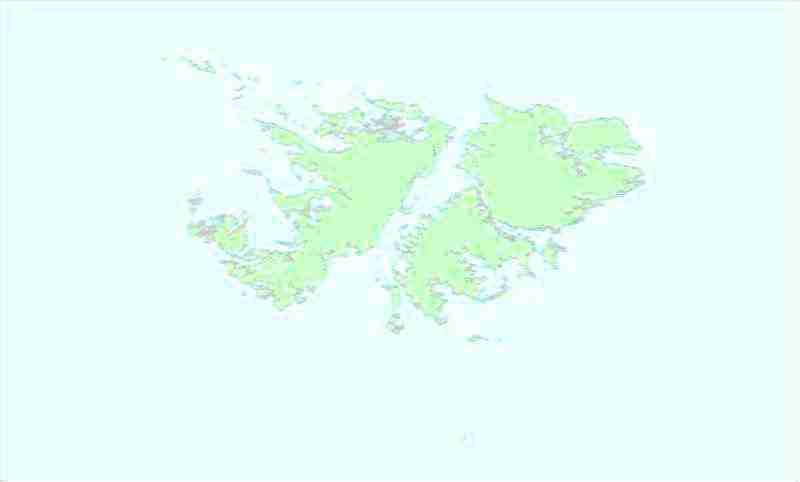 The irregular shape and large number of islands, gives the Falklands a very long coastline in relation to its land area, providing a wide variety of coastal habitats. This varied habitat, combined with the productive waters of the Patagonian shelf, make the Falklands a haven for seabirds, especially albatross, cormorants and penguins. Five species of penguin breed in the Falkland Islands - king penguin (Aptenodytes patagonicus), gentoo penguin (Pygoscelis papua), southern rockhopper penguin (Eudyptes chrysocome chrysocome), macaroni penguin (Eudyptes chrysolophus) and magellanic penguin (Spheniscus magellanicus). During the 1990s these populations have been studied in order to determine population size and status, and to determine the level of interaction with human activities in the Falkland Islands, including commercial fishing, tourism and oil exploration. These studies have revealed population declines which appear to be linked to commercial fishing activities around the Falklands. In order to investigate this phenomenon, penguin populations in South America have been studied since 1996 in order to provide a comparison. Southern rockhopper and magellanic penguins are only found in the Falkland Islands and along the Atlantic and Pacific coasts of southern Chile and Argentina. A study of these species has shown that populations in South America have not declined. The massive decline of these species has only occurred in the Falkland Islands. In the austral summer of 1995/96, an island-wide penguin census of the Falkland Islands was conducted (Bingham 1998a). All species were counted except for the magellanic penguin, which was not included because of the difficulties of censusing a species that nests in burrows. For gentoo and rockhopper penguins, nest counts were made to determine the number of breeding pairs. Counts were timed to correspond with the end of the egg laying period, thereby ensuring that few pairs were still to lay, and allowing an assessment to be made of the underestimate due to pairs failing, by using failure rates during incubation from other studies. The gentoo penguins concluded their first egg-laying by the end of October 1995. The 1995/96 census counted 15% of the gentoo population between 15th and 31st October, and the remainder between 1st November and 1st December. Because gentoos failing early tend to re-lay, and failure rates during incubation are low (c. 1% per week), the magnitude of any underestimates resulting from differences in survey dates should be well below 5%. Rockhopper penguins are much more synchronous in terms of egg-laying than gentoo penguins. Laying was concluded by mid-November 1995, and the 1995/96 census counted 98% of the rockhopper population between 1st November and 1st December (2% between 2nd and 18th December). Repeated counts of rockhopper colonies in previous years showed that nest counts drop at a rate of about 3% per week for the first month after egg-laying, as a result of failed nests. It is therefore unlikely that the average underestimate of rockhopper population exceeded 10%. For most rockhopper and all gentoo breeding sites, the recorder made two separate counts of all occupied nests using a tally counter. The mean of the two counts was taken as the number of breeding pairs. Where these counts differed by more than 10%, a third count was taken to give a mean of three counts. In practice this was rarely necessary, and the spread of results was usually well within plus or minus 5%. For the very large rockhopper colonies on Steeple Jason, Grand Jason, Bird Island and Beauchene Island, direct ground counts were not possible. These sites were counted using a total of 60 randomly selected sample plots to determine the range of nesting densities, and the areas of the colonies were determined to enable estimates of total breeding pairs. A minimum of 10% and a maximum of 15% of the total colony area was sampled at each of the sites. These measurements of area and density taken during the site visits were later compared against aerial photographs taken of the colonies. The margin of error for this methodology is greater than for direct counts, but should be within plus or minus 10%. The breeding cycle of the king penguin is different from that of gentoos and rockhoppers, with chicks over-wintering at the colony, and a complete breeding cycle lasting over a year. This tends to result in individual birds having their following breeding cycle out of phase with its predecessor; thus large chicks and eggs both occur in a colony at the same time. This complicates assessment of breeding pairs, so chick counts were taken instead. The estimation of error for chick counts is well below 5%, but will under estimate the number of breeding pairs by about 20% (Lewis Smith & Tallowin, 1979). During the 1990s a total of 40 breeding sites (1 king, 21 gentoo, 8 rockhopper and 10 magellanic) were counted annually in the Falklands to determine changes in population size. For king, gentoo and rockhopper penguins these counts were conducted as described above. Because magellanic penguins nest in burrows in the Falklands, nest counts were conducted by examining each burrow within the colony for signs of occupation and breeding activity. In difficult areas the use of a video camera on a long pole was employed. Each burrow occupied by a breeding pair was marked with a small spot of paint to prevent double-counting. Annual chick counts were also taken at each of the study sites prior to fledging, in order to determine annual breeding success (chicks per breeding pair). At known tourist destinations these parameters were compared for colonies visited by tourists, and those which were not, in order to investigate the impacts of tourism. Similar comparisons were made for colonies where eggs are harvested for human consumption. Diet samples were taken during chick-rearing and incubation by stomach-flushing adults returning to the colony after foraging. Composition and mass were determined by wet weight, and individual species identified by otoliths, beaks and carapaces. This data was compared with fisheries catch statistics in order to determine the level of competition between penguins and commercial fishing activities around the Falklands (Falkland Islands Government 1999). During the austral summer of 1996/97, a penguin census was conducted in South America, in order to determine whether penguin declines in the Falklands had occurred elsewhere (Bingham 1998b, Bingham & Mejias 1999). It had been shown during the 1995/96 census of the Falkland Islands that it requires little extra effort to count all penguin species during the course of such a census. The only exception was the magellanic penguin. Its widespread, low-density distribution in burrows made it impossible to census with methods employed for surface nesting species (Bingham 1998a). For this reason it was decided that the 1996/97 census would include all South American penguins, except for those of the Genus Spheniscus. During the 1995/96 Falkland Islands census it had been possible to conduct ground counts of incubating pairs at each of the breeding colonies, because most colonies were relatively accessible (Bingham 1998a). By contrast, many of the South American colonies are remote and inaccessible, and any attempt to conduct ground counts of each and every colony would have been doomed to failure. It was therefore decided from the outset that the census would be conducted by light aircraft, thereby negating the need to get ashore at difficult and remote sites. The location of all the Falkland Islands breeding sites had been known prior to the commencement of the 1995/96 census, but this was certainly not the case for South America. Although data did exist for a number of known breeding sites around South America (Frere et al. 1993, Venegas 1984, 1991, Woehler 1993), it was likely that other sites existed which had not been previously recorded. This was another reason for favouring an aerial census, since it provided the opportunity to cover large areas of suitable coastline in search of previously unrecorded colonies. This reduced the margin of error that would otherwise have arisen from new sites being overlooked, however the margin of error for aerial counts was likely to be higher than for ground counts. In order to quantify the margin of error likely to be expected from aerial counts, a number of aerial censuses were made of rockhopper colonies in the Falkland Islands for which the number of breeding pairs was also determined by ground counts. These aerial counts differed by a maximum of 14% from ground counts made of the same colony, giving a total margin of error of +/- 20% for aerial census data (Bingham 1998b). The 1996/97 aerial census was conducted throughout the known Eudyptes breeding ranges of Chile and Tierra del Fuego. The Atlantic coast of mainland Argentina was excluded from the census, since this coastline has been well studied, and does not hold any breeding sites for species covered by the census, except for a very small Rockhopper colony on Isla Pingüino, near Puerto Deseado (Frere et al. 1993). This colony is regularly monitored as part of an ongoing research programme, and population data from their research was used in favour of duplicating results. In 1996 an annual monitoring programme for magellanic penguins was established in southern Chile, in order to compare annual population trends, breeding success, foraging behaviour and diet composition between the Falkland Islands and Chile. In order to ensure compatibility, the methodology used for gathering data in Chile was identical to that employed in the Falkland Islands, and described above. The 1995/96 Falkland Islands census recorded 65,000 breeding pairs of gentoo penguin at 81 breeding sites (Bingham 1998a). This represents a 45% decline between 1983/84 and 1995/96 (Croxall et al. 1984). Annual monitoring indicates a partial recovery since 1995/96 to around 80,000 breeding pairs by 2000/01. This is equivalent to about 25% of the world population, estimated at 320,000 breeding pairs (Woehler 1993). Despite this recent increase, the Falklands population has shown an overall decline of 30% between 1983/84 and 2000/01. Gentoos have not declined in the remainder of their global range. The 1995/96 Falkland Islands census recorded 297,000 breeding pairs of southern rockhopper at 36 breeding sites (Bingham 1998a). This represents an 88% decline between 1983/84 and 1995/96 (Croxall et al. 1984). Annual monitoring indicates a slight recovery since 1995/96 to around 400,000 breeding pairs by 2000/01. Despite this recent increase, the Falklands population has shown an overall decline of 84% between 1983/84 and 2000/01. The 1996/97 South American census showed that Chile and Argentina hold a combined breeding population of about 175,000 pairs of southern rockhopper, at a total of 15 breeding sites (Bingham 1998b, Bingham & Mejias 1999). Studies since then suggest an increase to around 250,000 breeding pairs by 2000/01. Combined with the Falkland Islands population, this gives a total world population of around 650,000 pairs at 51 breeding sites. (South Georgia has been known to hold a few breeding pairs, but no more than 10 pairs have been recorded). Rockhopper penguins do not change the location of their breeding sites, providing a visual indication of major population change. In the Falkland Islands most rockhopper colonies are found in the centre of large expanses of bare ground, with vegetation having been destroyed by colonies that were once much larger. They appear rather like a pond that has dried out to leave a small puddle at the centre. By contrast most colonies in South America occupy the entire area laid bare, and new nesting areas can be found where vegetation has not yet been destroyed. These visual signs suggest that the Falklands decline of 84% between 1983/84 and 2000/01 has not occurred in South America. Indeed the nearest breeding site to the Falklands, on Staten Island (Argentina), shows signs of significant population increase over recent years, with several new colonies having been established in areas of dense vegetation. Although an island-wide census has never been conducted for magellanic penguins, distribution maps show that the Falkland Islands hold a globally significant population. Annual counts at 10 breeding sites during the 1990s indicate that magellanic penguins have undergone a 70% decline in the Falklands between 1990/91 and 2000/01. No studies were carried out prior to 1990/91, but since gentoo and rockhopper penguins underwent their greatest declines during the 1980s, it is likely that the overall decline of magellanic penguins is far greater than the 70% decline observed since 1990/91. Unlike gentoo and rockhopper penguins, magellanic penguins are still declining. In addition to the three main penguin species, the Falkland Islands has small numbers of king and macaroni penguin. The 1995/96 penguin census recorded 339 king penguin chicks, which allowing for losses during incubation and chick-rearing, and the staggered breeding cycle, gives an estimated Falklands population of around 400 breeding pairs (Bingham 1998a). This is a tiny proportion of the estimated 1,500,000 breeding pairs world-wide (Woehler 1993). Annual monitoring suggests that the Falklands population is stable at around 400 pairs. There are no macaroni penguin colonies in the Falklands, but a few macaroni penguins breed in rockhopper colonies around the islands. The total Falklands population of macaroni penguin is estimated to be no more than 50 pairs (Bingham 1998b). The 1996/97 census showed that South America holds a breeding population of about 12,000 pairs of macaroni, at a total of 9 breeding sites (Bingham 1998b). These sites are all situated on islands off Tierra del Fuego and southern Chile. Only the islands of Diego Ramirez, Ildefonso and Noir hold more than a thousand breeding pairs. The world population total of macaroni penguins is currently estimated at 9 million breeding pairs (Bingham & Mejias 1999). Comparison of breeding success for sites visited regularly by tourists and sites not visited by tourists showed no significant difference in the Falkland Islands or in Chile. VISITORS: 0.89 chicks per nest (3 sites / range: 0.57 to 1.36). Comparison of breeding success for sites where gentoo eggs are taken for food also show no significant difference. This surprising result is presumably due to the gentoo penguins' remarkable ability to relay. COMPARISON OF GENTOO PENGUIN BREEDING SUCCESS WITH AND WITHOUT HARVESTING OF EGGS. Comparison of breeding success between the Falkland Islands and Chile shows considerable variation. Isla Magdalena and Seno Otway are amongst the closest magellanic penguin colonies to the Falkland Islands (600 km). Both are in areas free of commercial fishing, and both show considerably higher breeding success than the Falkland Islands, which does have a large scale commercial fishing industry. Prior to 1987 fishing around the Falkland Islands was intensive and totally unregulated. No catch data or diet sample data exists for this period, during which huge penguin population declines occurred. Following a mass starvation of penguins in 1986, when many rockhopper colonies lost over half their adult population (Keymer 1988), it was agreed that commercial fishing around the Falklands needed to be regulated. This regulation was introduced in 1987, since when there has been strict controls on catch rates and target species taken. Diet sample analysis shows that some competition still exists between penguins and the Falkland Islands' fishing industry, especially for magellanic penguins which are still declining. This competition occurs mainly for loligo squid (Loligo gahi) and blue whiting (Micromesistius australis) (Falkland Islands Government 1999). For gentoo and rockhopper penguins the observed level of competition is now fairly low, and these species appear to have adapted to the change in prey abundance, albeit at a much lower population level than prior to fishing. However the level of competition remains high for magellanic penguins, with over one third of their observed diet being taken commercially. Magellanic penguins continue to decline. For all species the observed level of competition with commercial fishing will be an under-estimate. If there were no fishing activity the abundance of loligo squid and blue whiting would be considerably higher. Since diet sample studies have only been conducted since commercial fishing began, the abundance of these species in penguin diet will be artificially low, under-estimating the true level of competition between penguins and the fishing industry. Over the last 4 years, breeding success and chick survival rates have been substantially higher in Chile (average 1.35 chicks per nest) than in the Falklands (average 0.82 chicks per nest). These differences are matched by considerable differences in food being brought back to chicks. Around Isla Magdalena in Chile, where commercial fishing is banned to protect wildlife, adult penguins require an average of 18 hours to find sufficient food to feed their chicks. In the Falklands the average is about 35 hours. As a result chicks in the Falklands are only receiving half as much food as chicks in Chile. On Isla Magdalena only 24% of breeding adults failed to raise at least one chick, but in the Falklands this increases to 63%. More than twice as many nests are abandoned in the Falklands as in Chile. Of those that are not abandoned, only 21% raised two chicks in the Falklands, compared to 45% in Chile. In the Falklands, magellanic penguin populations have declined so much that it is now visible in the colonies themselves. At most Falklands breeding sites 80 to 90% of burrows are unoccupied or derelict, as adults that made burrows have died or moved away, without being replaced. On Isla Magdalena in Chile, less than 10% of burrows are unoccupied. Competition for burrows is so intense that many new breeders are forced to nest in areas where the ground is unsuitable for making burrows. These pairs must breed on the surface like gentoos, where they suffer greater predation from skuas. In April 1998 the "Borgny Dolphin" oil rig arrived in the Falkland Islands to begin oil exploration. During the five months of operation three separate oil spills occurred around the Falklands, killing hundreds of penguins and cormorants. Each of these spills was relatively small in scale, and only certain areas were affected. It is unlikely that the oil came from the rig itself, which claimed never to have found oil in significant quantity. The most likely explanation is that the spills came from oil rig supply vessels. There were no such spills prior to the arrival of the rig, and no further spills have occurred since the rig left in late 1998. Species most affected by the oil were king, rockhopper and magellanic penguins and king and rock cormorants. Rockhopper penguins were not affected, since they had not returned from their winter migration. None of the oil actually reached the coast, and breeding sites were not contaminated. Penguins were contaminated offshore, and returned to the breeding site in an oiled condition. By the onset of egg-laying the oil rig had left, and oiled penguins had either died, been rescued and cleaned by concerned residents, or preened themselves clean, thereby ingesting toxins that would damage internal organs. Population counts conducted around the Falklands during November 1998 showed that many breeding sites contained a significant proportion of deferred breeders, causing a reduction in the breeding population. Many adults were below the weight that would be expected at the start of the breeding season. Penguins, cormorants and albatross were all affected, but king cormorants were the worst affected, with breeding numbers down by 40% since the previous season. Rockhopper penguins, which had been away from the Falklands during the spills, were the only species to appear in good physical condition. Penguins and cormorants that did attempt to breed showed below average breeding success during the 1998/99 season, and there was a noticeable reduction in breeding success for penguins and cormorants at sites which had previously been affected by oil, compared to those which had not. The mechanism for the observed reduction in breeding success for sites affected by oil is uncertain. It could be that adults in affected areas were in poorer physical condition as a result of ingesting toxins from oil whilst preening, or from feeding on contaminated food. This is partially borne out by observations that adults returning to breed were underweight, to the point where many did not attempt to breed at all. Adults that did attempt to breed in poor physical condition would be less successful at gathering food to keep chicks fed. Taking into account those adults which did not attempt to breed during 1998, the overall reduction in breeding success was far greater than shown in the graphs above, which shows the success rate of pairs that attempted to breed. The Falkland Islands is an important breeding site for gentoo, rockhopper and magellanic penguin. Over the last 20 years these three species have undergone population declines, with rockhopper and magellanic penguins being the worst effected. These declines are linked to low breeding success and reduced abundance of prey during the critical chick-rearing stage. As the British Task Force set sail in 1982, newspapers described the Falklands as an island of two thousand people and six million penguins. Two years later an assessment of seabirds in the Falkland Islands confirmed this report, recording 2,500,000 pairs of rockhoppers and over 100,000 pairs of gentoo penguin (Croxall et al. 1984). Falklands penguins now number only a quarter of that figure, despite recent increases by gentoo and rockhopper penguins. These two species declined throughout the 1980s and early 1990s, and reached their lowest point in 1995/96, since when populations have recovered slightly. Whilst it is comforting that rockhoppers and gentoos have recovered slightly over the last 5 years, it must be remembered that rockhoppers still number less than 20% of just 18 years ago. This massive decline is documented in various scientific publications (Strange 1992, Prince 1991, Keymer 1988, Bingham 1998a, 1998b, Bingham & Mejias 1999). These declines did not occur anywhere else in their breeding range. The problem was unique to the Falklands. The good news is that Falklands rockhoppers and gentoos do appear to have reached a new equilibrium that is now in balance with current food availability. Provided that commercial fishing continues to be carefully managed, these populations should remain safe, albeit at a lower level than prior to commercial fishing. The bad news is that magellanic penguins are still declining. It is impossible to give an accurate population total for magellanic penguins in the Falklands, but we do know that study sites monitored throughout the Falklands during the 1990s have shown a 70% decline over the last 10 years, a decline which is still occurring. It has been suggested that these declines are part of a global trend, but that is not the case. Magellanic and southern rockhopper penguins are only found in the Falklands and South America, and there are no signs of decline in Chile or Tierra del Fuego. Indeed the closest colonies to the Falklands on Isla Magdalena (Chile) and Staten Island (Argentina) appear to have increased as Falklands populations declined. Large scale commercial fishing began around the Falkland Islands during the 1970s, and this reached its peak by the 1980s. Prior to 1987 this fishing industry was totally unregulated, with virtually no catch statistics being recorded. In 1986 the Falklands suffered a mass starvation of penguins, with rockhopper penguins being the worst affected. Many rockhopper colonies lost over half their adult population as a result (Keymer 1988). This event prompted the regulation of commercial fishing around the Falkland Islands through the establishment of a 200 mile exclusion zone controlled by the Falkland Islands Government. Since 1987 catch rates have gradually been reduced by controlling the number of boats licensed to fish (Falkland Islands Government 1999). For squid, the catch rate per unit effort of fishing vessels is now monitored on a daily basis to determine when the target of 60% biomass has been removed each year. The remaining 40% biomass is deemed by the Falkland Islands Government to be adequate as prey for seabirds and marine mammals, and as breeding stock for the following season. Whilst this may ensure sustainability of stocks as a financial resource, it seems unreasonable to suppose that 60% of the biomass can be removed prior to the breeding season of seabirds and marine mammals, without having an impact on those species which rely on such prey for successful breeding. Diet sample analysis shows that there is competition between penguins and commercial fisheries for loligo squid (Loligo gahi) and blue whiting (Micromesistius australis). Fisheries statistics indicate that controls on fishing effort introduced in 1987 have allowed stocks of Loligo gahi to increase substantially between 1987 and 1996. In 1987 one month of fishing effort caught 220 tonnes of loligo. By 1996 this had nearly trebled to 600 tonnes (Falkland Islands Government 1999). It is reasonable to suppose that penguins also benefited from this increase in catch rates per unit effort, although the catch per unit effort would be even greater if 60% of loligo biomass was not still being commercially harvested every year. The level of competition with commercial fisheries now appears to be low for gentoo and rockhopper penguins, but fairly high for magellanic penguins. Nevertheless, since diet samples have only been taken in the presence of commercial fishing activities, the proportion of target species found as part of the penguin diet will be greatly reduced. Diet analysis will therefore significantly under-estimate the level of competition between penguins and commercial fisheries. Competition for food is likely to be exacerbated by the fact that the commercial fishing season runs until the end of October, when penguins and other seabirds begin breeding. Since squid stocks are managed by recording the daily decline of catch per unit effort for each vessel, it stands to reason that penguins will also encounter a decline in catch per unit effort as they enter their critical breeding phase. Breeding places great demands on adult penguins to find sufficient food for themselves and their chicks. Each adult can only feed once every two days whilst its partner incubates the eggs or chicks, and the foraging range is greatly reduced by the need to return to the nest on a regular basis. Penguins do not have crops like other birds, so all the food caught passes directly into the stomach. Food caught too far away from the nest would be digested before the adult returned to feed the chicks. Each adult must first catch sufficient food for its own requirements, and the chicks rely on food which is surplus to the adults metabolic needs. Unless food is abundant during this critical period, adults are unable to find the extra food needed to keep their chicks well fed. Even a small reduction in food abundance is likely to lead to a reduction in chick survival. Magellanic penguins take nearly twice as long to find food for their chicks in the Falklands (35 hours) as they do in Chile (18 hours), where large-scale commercial fishing does not occur. This means that chicks in the Falklands receive approximately half the quantity of food, and chick survival is greatly reduced. It would appear that the current level of breeding success in the Falklands is inadequate to replace natural adult mortality, leading to the population decline that is still occurring. With the exception of the mass starvation in 1985, this was probably the mechanism of the Falklands decline in gentoo and rockhopper penguins also. The worst declines occurred during the 1980s when fishing was at its height. Since then the decline has diminished, and finally halted, due to a number of factors. Commercial fishing in the Falklands is now better managed, and fishing effort has been reduced. Penguins may also have adapted their foraging strategies to counter the reduced abundance of certain species. Populations have also stabilised at a much lower level than prior to commercial fishing. With much fewer penguins there is less intra-specific competition for food, and gentoo and rockhopper populations appear to have been reduced to a point where they are now in balance with the level of food remaining. This trend has also been seen amongst marine mammals in the Falklands. Elephant seals and southern sealions, which also compete with commercial fisheries for food, have both undergone huge population declines in the Falklands (Galimberti 2000, Strange 1992, Thompson & Duck 1996). As is the case for penguins, these species also occur in South America where no such declines have occurred. King penguins and fur seals, which feed on prey not commercially harvested, have both increased in the Falklands since commercial fishing became established. Concerned by the continuing decline of magellanic penguins in the Falkland Islands, the International Spheniscus Penguin Working Group passed a resolution in September 2000 requesting the exclusion of commercial fishing from within 30 miles of penguin breeding sites during the breeding season. If this resolution was adopted in the Falklands, it would reduce the total area of commercial fishing grounds by less than 5%. The Falkland Islands Government have argued against the introduction of such exclusions zones, citing satellite tracking studies that suggest magellanic penguins often forage beyond the suggested exclusion zone. Whilst this does appear to be the case at present, it is also apparent that such long-distance foraging is not normal in other areas, and it could well be that penguins in the Falklands are being forced to forage further afield because of commercial fishing activity. Foraging studies in Chile show that if waters close to penguin breeding sites are kept productive by the exclusion of commercial fishing, then penguins prefer to forage close to their nest site, enabling chicks to be fed more frequently. Concerns about the removal of gentoo penguin eggs for human consumption were not borne out by the data, which suggest little effect on breeding success. Unlike most other penguins, gentoos have the ability to relay within a few days of loosing their clutch. This enables them to rear chicks successfully after losing their first brood. Although egging could hardly be advocated by conservationists, it is a Falklands tradition which is gradually dying out due to an improved infra-structure which allows access to a wider range of farm produce. Conservationists have taken the view that it is preferable to let the tradition die a natural death, rather than risk a resurgence by threatening people's right to continue the practice. Tourism is another potential cause for concern. The Falkland Islands are now one of the world's most popular destinations for penguin spotters, and this growing tourist industry is a potential threat to penguins. The Falkland Islands, which has a population of around 2,500 inhabitants, received 37,000 visitors during the 1999/2000 season. South America is also seeing a rapid increase in tourists visiting penguin colonies. Punta Arenas in Chile has developed a thriving tourist industry, with tours to local penguin colonies being amongst the prime attractions. - Incubating birds may be frightened away allowing predators to take eggs or young. - Raised metabolic rates brought on by stress may lead to greater food requirement. - Natural behaviour, such as courtship or the feeding of young, may be disrupted. - Adults could be scared away completely, causing them to abandon eggs or young. - Severe disturbance could lead to adults or young being killed or injured. - Penguins which live in burrows may be killed if burrows collapse under human weight. These potential consequences of disturbance should all lead to reduced breeding success if they are occurring at a significant level. Results to date suggest that the current level of tourism is having no significant detrimental effect on breeding success for any of the penguin species. This was true for both the Falklands and southern Chile. Ecotourism undoubtedly has a number of benefits. It provides wildlife with a commercial value, giving support for its protection within the commercial sector. It also educates and entertains the people who see the wildlife, raising awareness and gathering support for wildlife protection within the community as a whole. It is difficult to provide strong argument for wildlife protection unless people can relate to wildlife on a personal level. It is therefore important to promote ecotourism, whilst at the same time ensuring that such tourism does not damage the wildlife resources which people come to see. There are clearly a number of threats facing penguin populations in the Falkland Islands, but penguin populations appear very robust to disturbance and moderate levels of exploitation on land. Major changes to the landscape brought about by livestock, the removal of eggs for food, and exploitation as a resource for tourism, all appear to have had little impact on penguin populations. Over recent years it has been changes to the abundance of prey which has had the greatest impact on penguin populations, and prey abundance is the major determining factor on population size. Whilst it is unrealistic to expect the Falkland Islands Government to halt commercial fishing activity, which is an essential source of revenue to the islands, minor changes should be looked at to mitigate the effects of commercial fishing on penguin populations. The other area of major concern is oil exploration. Oil exploration is scheduled to recommence around the Falklands in the near future, and unless environmental protection is greatly improved, it is probable that many more penguins will die in unnecessary oil spills. Although the oil spills which occurred during the 1998 round of oil exploration were fairly small, the damage caused to seabird populations was far reaching. In addition to penguins and cormorants which died from oiling, many others abandoned breeding for the following year, and many which attempted to breed showed much higher failure rates, probably due to poor physical condition resulting from the ingestion of oil. The Falkland Islands are an internationally important breeding site for penguins, and it is vital that the Falkland Islands Government accept their responsibility to protect this natural resource. Per capita the Falklands is one of the wealthiest places on earth, with an annual government revenue of US$3,000 for every man, woman and child living in the islands. As such there is no reason why commercial interests should not be balanced with a responsible attitude towards wildlife protection. Thanks go to the Environmental Research Unit, Falklands Conservation, Chilean Government (CONAF Region XII), Fundacion Otway, Royal Air Force, FIGAS, DAP, Claudio Venegas, Dr Nicolas Soto, Ricardo Fuentes and Elena Mejias for logistical support. Also to the Conservation & Research Foundation, Connecticut, USA, for funding support. Bingham M (1998a) The distribution, abundance and population trends of Gentoo, Rockhopper and King Penguins in the Falkland Islands. Oryx, 32(3): 223-32. Bingham M (1998b) Penguins of South America and the Falkland Islands. Penguin Conservation, 11(1): 8-15. Croxall JP, McInnes SJ & Prince PA (1984) The status and conservation of seabirds at the Falkland Islands. In Status and conservation of the world's seabirds, ICBP Technical Publication No.2, (ed. JP Croxall, PGH Evans & RW Schreiber), 271-291, ICBP, Cambridge. Falkland Islands Government (1999) Fisheries Department Fisheries Statistics, Volume 3, 1989-1998, 75pp. FIG Fisheries Department, Stanley. Frere E, Gandini M, Gandini P, Holik T, Lichtschein V and Day MO (1993) Variación anual en el número de adultos reproductivos en una nueva colonia de pingüino penacho amarillo en Isla Pingüino (Santa Cruz, Argentina). Hornero, 13: 293-294. Galimberti F (2000) Elephant Seals of the Falklands. Elephant Seal Research Group report, Milano, Italy. Keymer IF (1988) An investigation of Rockhopper Penguin mortality in the Falkland Islands during the 1985/86 breeding season. Falkland Islands Foundation Project Report, 19pp, Stanley. Lewis Smith RI & Tallowin JRB (1979) The distribution and size of king penguin rookeries on South Georgia. British Antarctic Survey Bulletin, 49: 259-276. Strange IJ (1992) Wildlife of the Falkland Islands and South Georgia. Harper Collins, England. 188pp. Thompson D & Duck CD (1996) Southern Sea Lions in the Falkland Islands. Sea Mammal Rsearch Unit report, Cambridge. 48pp. Venegas C (1984) Estado de las poblaciones de Pingüino de Penacho Amarillo y Macaroni en la Isla Noir, Chile. Informe Instituto de la Patagonia, 33. Venegas C (1991) Estudio de cuantificacion poblacional de pingüinos crestados en Isla Recalada. Informe Instituto de la Patagonia, 55. Woehler EJ - (1993) The distribution and abundance of Antarctic and Subantarctic Penguins. SCAR, Cambridge.